Through many years of research and development, AmeriTube has designed and fabricated the best light gauge (14 ga.) tubular steel frame systems on the market today. AmeriTube is the only manufacturing company that builds frame systems by cutting and welding the main component pieces that make up the trusses. Other companies use a process that bends the tubing and/or has a swaged end that fits together; others use gusset plates to connect the tubing. None of these designs have proven to be as easy to erect OR as strong as the AmeriTube design. AmeriTube structures are pre-engineered and designed to be in compliance with the IBC2003 Building Code and ASCE 7-02 Wind Provisions. Galvanized AmeriTube frames are designed for open structures, such as carports, RV covers, boat covers, or combo carport/storage area. The Red Color-Shield AmeriTube frames are designed for all enclosed buildings such as garages, workshops, warehouses, storage sheds, or even office/warehouse combo buildings. All AmeriTube structures are designed to be adaptable to whatever your needs are, whether it is for residental, commercial, industrial, and/or agricultural uses. AmeriTube structures are strong, attractive, and affordable. It's simply the BEST DESIGN on the market today. 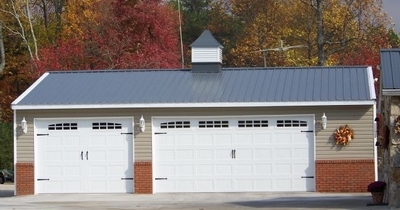 Let PJ Buildings construct your next AmeriTube building.